UPDATE: This contest is changing! The ceremony will now be held on a rooftop. Check out their Facebook page for more details. Home Run Inn Pizza, the best pizza in Chicago, best frozen anywhere, is hosting a pretty cute promotion with another Chicago great, Lou Malnatis. 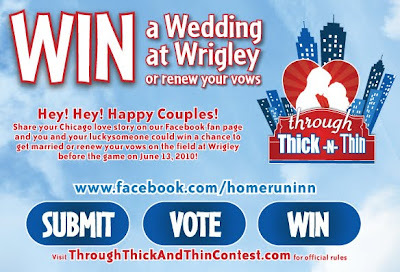 One lucky couple will get married (or renew their vows) on the field at Wrigley during a Cubs v. Sox showdown. You also score 10 tickets to the game, a trolley ride afterwards and a tiered pizza wedding cake. I thought the through thick (Lou Malnatis is known for their deep dish) and thin (HRI makes thin) concept was pretty adorable. Jake is as big a Sox fan as I am a Cubs fan. He would probably prefer this happened at Comisky- I mean, US Cellular Field- but I will definitely be entering! Visit their Facebook page for more details. Sounds like fun and pizza who could resist. Pizza, Pizza, Pizza... one of my favorite...thanks for sharing..